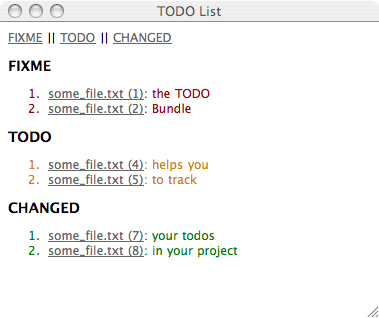 TextMate's TODO bundle lets you keep track of the TODOs in your projects. 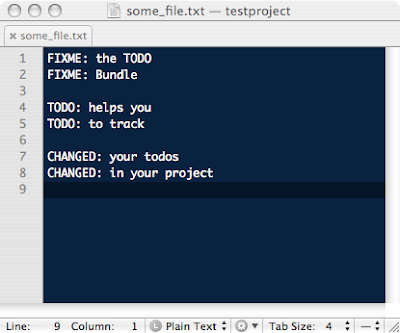 You can mark a line to show up in the TODO list with FIXME, TODO or CHANGED. The following two images show a text file with these keywords and the resulting TODO list. The only problem is that if you keep a copy of Rails in vendor/, then the TODO plugin will also show the items in Rails (or any other external libraries and plugins you have in your project. This blog entry on exdolo.com describes how to get rid of the external items in your project with a sledgehammer: Add the vendor/rails folder to your global TextMate ignore list. 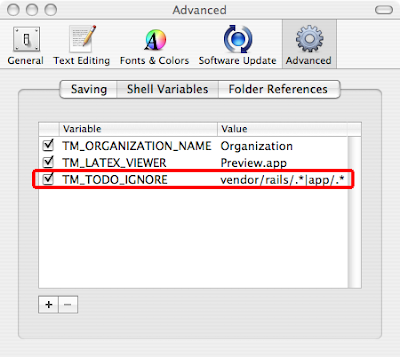 However, there is a cleaner way: Open TextMate's Preferences Pane, go to Advanced » Shell Variables and the shell variable TM_TODO_IGNORE. You can set this variable to a regular expression as you would use it in Ruby (since the TODO bundle is written in Ruby). Et voilá: Rails-less TODO lists. SQLite is great. No, really, I do mean it. If you ever need to work on structured data and editing it from the outside is a must, then SQLite is worth checking out and might be a superior choice to XML and will be a superior choice to your own proprietary format. I cannot speak about performance - there are some outdated claims that SQLite is faster than postgres and mysql for the most common operations; but those benchmarks don't feature a single join, and that's where database implementation gets interesting and hard. I just cannot believe that SQLite stands up to any full scale DBMS. I spent a few hours chasing down a bug in my own code after realising that I've been utterly stupid and put my parameters in the wrong order into my parameter list. ERROR: invalid input syntax for integer: "bla"
I know now what to look out for in the future. computer science (prepare for some math, hehe). So have fun and stay tuned.